Dreamforce is less than 90 days away. Did you get that? LESS THAN 90 DAYS AWAY! 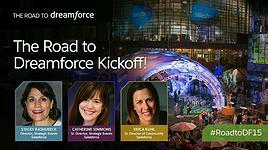 The official Road to Dreamforce live stream kicked off this week. If you haven’t heard of it before, here’s a link to the last recording. This series is one of my favorites to utilize in preparing for Dreamforce. You’re given the opportunity to hear #DF15 information directly from those that are planning the conference. You’re also given the chance to submit your questions. I don’t know of any other conference that gives you that much access! Throw in some prizes (including chances to win a free conference pass) and it’s a great way to stay up to date on what’s new for the conference this year. If this is your first Dreamforce, you should be networking NOW. Utilize Success Community to join conversations around the topics that interest you. Start a list of knowledge experts that you want to connect with in September. Many of these individuals are likely User Group Leaders and MVPs. Some of these same individuals will be running sessions at Dreamforce this year. Follow these individuals on Success Community and Twitter (for some great laughs search #WhySFAdminsDrink). Interact with these thought leaders and see what content they are pushing out to the community. This is a great way to learn tips and tricks relating to reporting, marketing and analytics. There’s no reason to feel like an outsider at Dreamforce. The conference is massive and it can definitely feel overwhelming (especially the 1st time you attend), but remember that we’ve all been in your shoes. Many Success Community groups have been created around coming together at Dreamforce and having a sense of community well before the conference. Last year Jennifer Spanner (Wilmington UG Leader) and I held office hours at the Security station in the ​Admin Zone. We were scheduled for an hour, but after many great conversations and questions, we were there over two hours. We found ourselves running live demos in Sandbox and showcasing the solutions that we were describing (I’m a visual learner and sometimes seeing is believing!). By helping new Admins decode the mystery around fields, formulas and security, we were able to then shift the conversation back to the needs of the business and help those Admins plan for next steps after the conference. It was one of the most rewarding experiences that I have had at Dreamforce. [Spoiler: We’ll be back again this year!] The Admin Zone (and Developer Zone) are a great place to ask specific questions relating to your Org. Real customers, real problems and real solutions! Don’t stop there though, feel free to ask questions relating to your own professional growth as well. We’ve all faced the same challenges with career development and are happy to share what we’ve learned along the way! Kelly Bentubo is a Salesforce MVP, Charlotte, NC User Group Leader and #Awesome Admin!